High fashion is about to meet high tech as Apple's hired Paul Deneve, formerly CEO at Yves Saint Laurent, as a vice president to work on "special projects." First confirmed by Bloomberg, Deneve is actually a former Apple employee, having a hand in sales and marketing in Europe during the '90s. Now, as he says au revoir to YSL, Deneve will report directly to Tim Cook. So what skill set does Deneve bring to the table, besides an Apple-ic past? Clearly his experience selling luxury goods could come into play for future Apple products, particularly as the firm seems set to offer wearable tech like the iWatch. A cheap iPhone could certainly use a haute couture touch, too. Have you seen those garish case leaks? Interestingly, despite his background, Deneve won't fill the seat vacated last year by John Browett as head of retail. 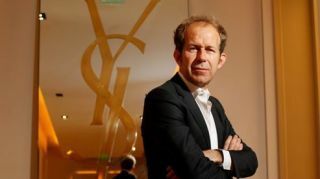 Whatever YSL's leaving leader ends up stitching together, we're sure that with his penchant for design, Jony Ive will have plenty to chat with Deneve about on his first day. Like sweater vests, our news blips are always in style.